Aerial of Rynearson Stadium. Photo courtesy of EMU Athletics. Rynearson Stadium (Ypsilanti, MI). Home of the Detroit Wheels. 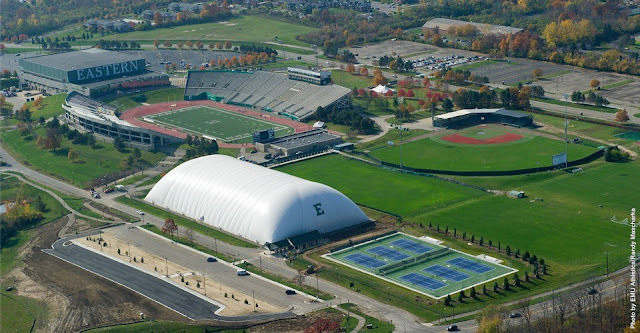 - Rynearson stadium is home to the Easter Michigan University Eagles. - The stadium is named after Elton J. Rynearson, Sr., who coached football at Eastern Michigan for 26 seasons. - The Wheels initially hoped to play in Tiger Stadium in Detroit but since the Detroit Lions of the NFL played there the Wheels needed to find a different home. They moved nearly 40 miles west to play in Rynearson Stadium. - Dan Boisture was hired as the Wheels head coach after coaching the Eastern Michigan Eagles from 1967-1973. Boisture’s record at EMU was 45-20-3. His record with the Wheels was 1-13 before the franchise folded with six games remaining in 1974. - Original capacity was 15,500 but expanded to 22,227 and lights were added when the Detroit Wheels announced they were going to play there. - The most fans the Wheels drew at home was reportedly 14,614 against the Birmingham Americans (The Americans would go on to win the one and only World Bowl). In what would be their final home game the Wheels only drew a reported 6,351 spectators. The Wheel’s lost all five of their home games.